1883 was a year marked by few momentous military events, political upheavals or social conflicts although the year had, as always, its tragedies and disasters. 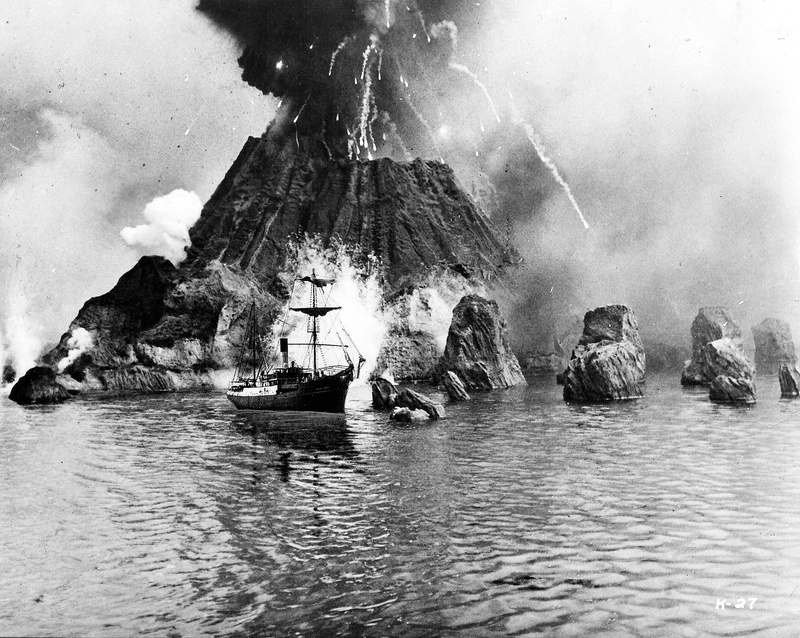 It would have been a very boring year in the historical record had not an insignificant volcanic island between Java and Sumatra erupted and obliterated two thirds of the island. The explosion generated the largest sound ever heard in modern history and while it was not heard in Calais, it was heard by people 3000 miles from the island. The force of the explosion was the equivalent of 13000 Hiroshima A bombs and the tidal waves killed up to 40000 people. Within 32 hours of the eruption the water level in the Thames below London rose to unnatural levels and the world climate was affected for many months by the ash spewed into the atmosphere. The photo above purports to show the explosion although we can’t say it is authentic. 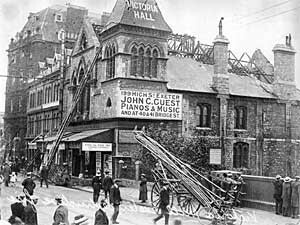 One of the most tragic events of the year occurred In Sutherland England on June 16, 1883 at the Victoria Hall Theatre. 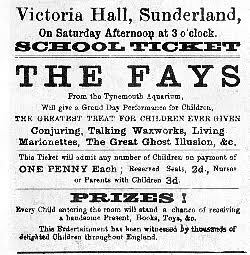 An afternoon of children’s variety show presented by Mr. and Mrs. Fay ended in the deaths of 183 children. At the end of the show, which was attended by 1100 children, it was announced that children with certain ticket numbers would be presented prizes on the stage. The kids downstairs in the main hall rushed toward the stage and those in the gallery, fearful of missing out on their prizes, charged down the stairs to the main hall only to encounter a door bolted to allow a space only wide enough for one child to squeeze through at a time. In the crush at the bottom of the stairs 183 children were asphyxiated. 1883 was fairly uneventful in the United States which made the trial of Alfred Griner Packer more of a media circus than it perhaps deserved. Packer and 5 other prospectors attempted to travel through the high mountains of Colorado during the winter of 1882-83. Only Packer emerged from the mountains and it was eventually discovered the men had turned to cannibalism when the food ran out, in some instances hastening the death of the next meal by shooting the victim. Packer was convicted of murder and sentenced to death but in a retrial was found guilty of manslaughter and given a 40 year sentence. In other news times zones were established by the railroads in order to keep the trains running on some sort of consistent and predictable schedule and Edison provided the City of Roselle New Jersey with electricity using wires on poles making it the first city “on the grid”. Waterman invented the fountain pen in 1883, the country’s first vaudeville theater opened in Boston and the first rodeo was held in Pecos Texas. 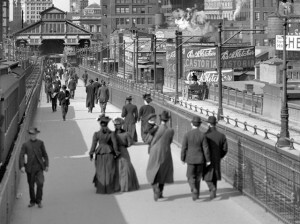 The Brooklyn Bridge, then the longest suspension bridge in the world, opened to much acclaim on May 23rd, 1883 only to be struck by tragedy a few days later. 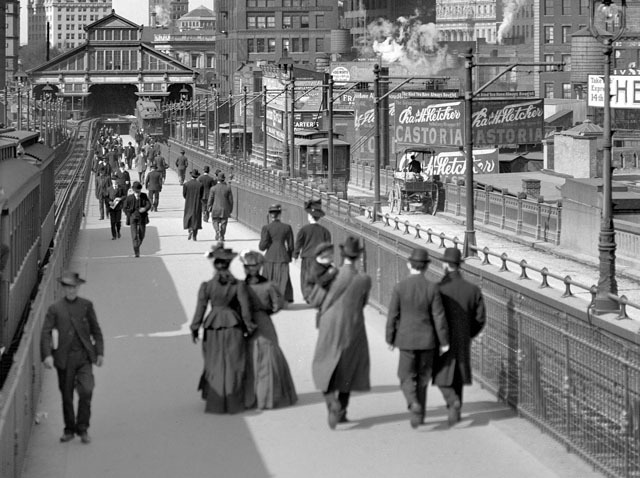 In the first week tens of thousands of New Yorkers walked across the bridge on the walkways but on May 30th a rumor began circulating on the bridge that it was collapsing. 12 people were killed in the stampede to get off the bridge. 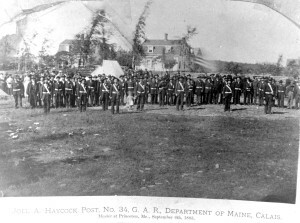 In September of 1883 the Grand Army of the Republic mustered on the parade grounds in Princeton. 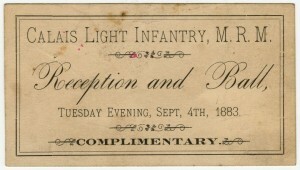 In the early decades after the Civil War musters were held annually in local towns and attended by hundreds of veterans. In the above photo GAR post 43 from Calais is pictured at the Princeton muster. There would have many other GAR posts from this area in attendance and given the size of the Calais post quite a crowd at the Princeton fairgrounds. 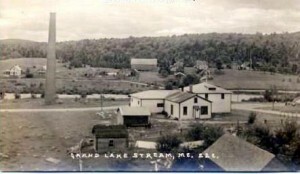 In 1883 the Shaw Brother tannery in Grand Lake Stream closed briefly as a result of financial reverses.The photo above shows only one of the smokestacks remaining from the tannery. The tannery did reopened and continued in business until 1898. Built in 1870 it was at one time the largest tannery in the country- hides from as far away as Texas arrived by steam ship at Calais and were transported by railroad to Princeton where the lake steamers took the hides to the tannery. Grand Lake Stream and the surrounding area had a natural abundance of hemlock whose bark when boiled produced tannin, the vital ingredient in the tanning process. “The tannery complex was built on a blasted site stripped bare of forest. The sawmill came first, followed by bark mill, leach house, furnace house, the six-hundred-foot tan-yard building, and ten-story dry loft, a roll loft, the underground beam rooms and sweat houses, and support buildings. Nor should we overlook a 350-yard canal, huge penstock, locks, scows, and steamers. As the tannery grew, a scraggly village materialized, while, out in the woods, hundreds of men with horses peeled, stacked, and hauled thousands of cords of bark. Many of the construction workers were Quebec French. 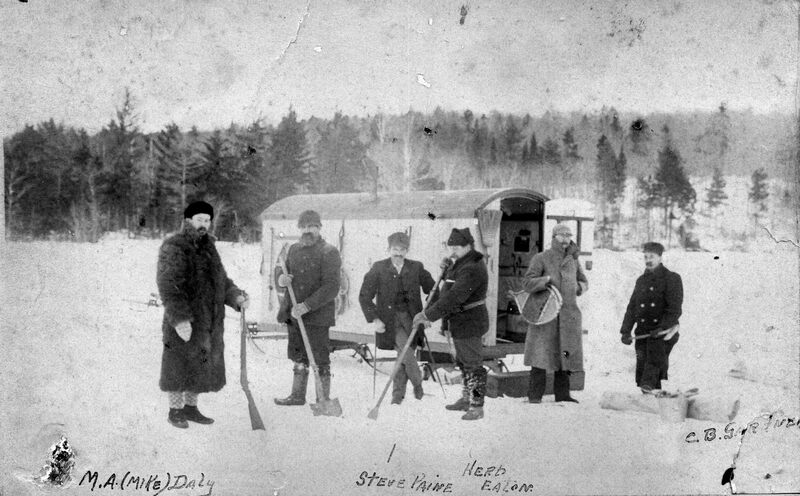 The regular workers were mostly Provincials, along with an assortment of other nationalities. Entire families shared single rooms. Wages were low, but newly arrived hopefuls worked out their keep on a farm owned by the Shaws while awaiting an opening. There was no paint, inside or out. A big company store salvaged as much of the payroll as possible. The village was landscaped with boulders, stumps, and rubble, and the stream, polluted by sawdust and filth. Carts laden with reeking beam-room refuse, intended for fertilizer, dripped and slopped along the rough roads, distributing the bounty far and wide. Drunkenness was common, yet violence and serious crime were rare. There was no law officer and no doctor, and the seriously injured or ill often suffered several days before professional help arrived. A proposed railway to the tannery was never built, and transporting the hides in and out over the phenomenally rough road, or by the old steamer Captain Lewey, to Princeton, was not an efficient arrangement. Other Shaw tanneries in Maine were at Kingman, Jackson Brook, Vanceboro, and Forest City; the brothers’ complete holdings of tanneries and extract works totaled thirty-nine. 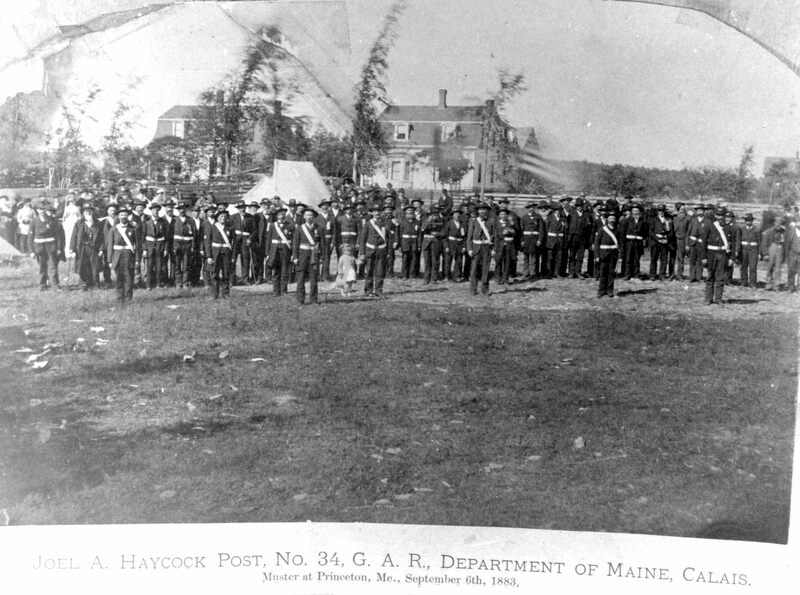 In July 1883, the Shaws’ empire collapsed, shocking Boston financial circles and stunning eastern Maine. Operations were resumed at Grand Lake Stream under new owners, lasting until 1898, when the last act was played out by Boston junk dealers. 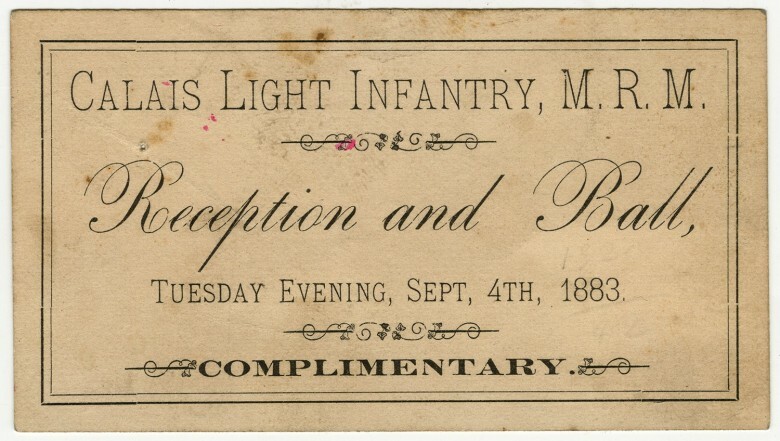 Fayette Shaw, meanwhile, had moved on to found a new tannery empire in Wisconsin. The H.L. Drake was financed with the surplus from an insurance settlement after an 1887 fire at Grand Lake Stream that burned the tan yard, beam room, and dry loft. Given the high rate of conflagration in the tannery industry, it seems remarkable that insurance could even be obtained. A procession of some twenty-six two-horse teams passed through St. Stephen recently on their way to and from the Custom House for being bonded. The teams were collected in New Brunswick by an agent of Shaw Bros. and are intended for bark hauling in the forests of this section for that firm. The team, the greater number of them consisting of fine looking and powerful horses, made a very attractive appearance. It stated that Shaw Brothers require one hundred just such teams to haul bark for them the present winter. 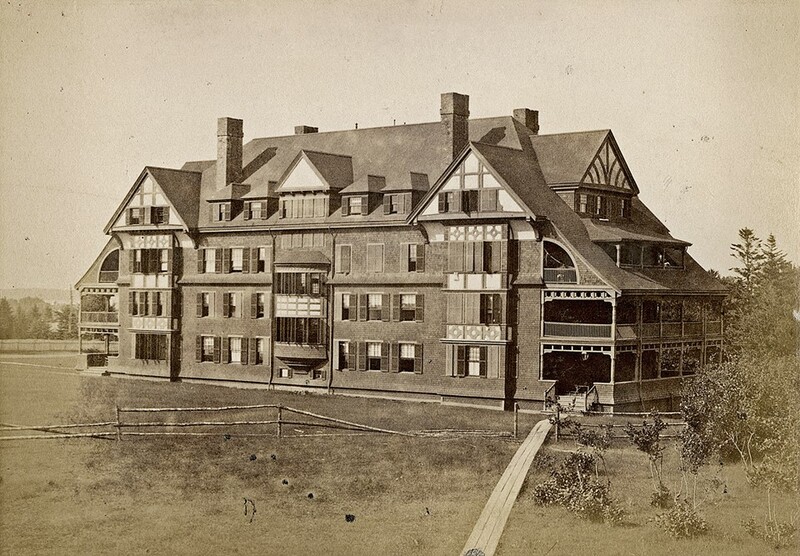 – The [Bangor] Industrial Journal, Jan. 5, 1883.” The above photo shows the Queen Anne style Tyn-Y-Coed Hotel on Campobello Island, New Brunswick shortly after it was built in 1882.It opened for business in 1883. Cummings and Sears, architects from Boston, designed the plans for the hotel. The local newspaper of the day reported that the hotel had 60 rooms and cost $25,000. 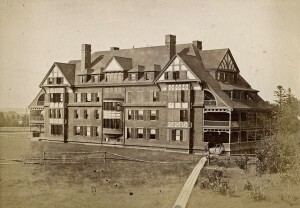 It was one of several such luxury resorts in the area at the time mostly sponsored by railroad interests which found a ready market in the cities of the eastern United States. Wealthy families would spend the “season” at one of these resorts while the patriarch added to the family fortune in the markets and counting rooms of New York, Boston and Philadelphia. The most famous of the resorts locally and only survivor is the Algonquin in St. Andrews. In Calais the citizens entertained themselves with balls and plays, mostly staged at the Opera House on Main Street. 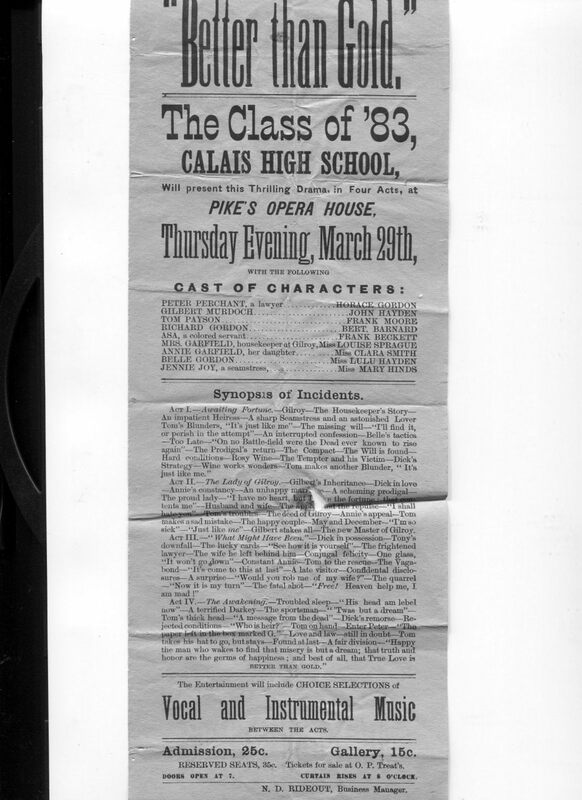 There was a good deal of musical talent and many willing actors in Calais including the students at Calais Academy who produced first rate plays on a regular basis. 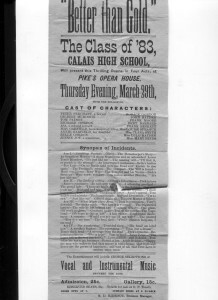 Acting clubs and civic organizations organized events and the Calais Band and smaller bands performed nearly every weekend. This made for a sense of community which is sadly lacking today. In other Calais news of 1883 the Calais Times published an article warning of the dangers of drinking tea. It warned that “excessive tea-drinking has created a generation of nervous, discontented people who are forever complaining of the existing order of the universe, scolding their neighbors, and sighing after the impossible.” The article says that drinking this “Chinese herb” leads to revolution and the “ growth of Radicalism may be gauged by the increase in the imports of tea”. Much better to drink Sarsaparilla which an 1883 ad for Horton Drug Store on Main Street claims cures rheumatism and all manner of diseases of the blood.